Kitchen Takeover: In which I cook elaborate meals that my parents don't really want to eat. Is it kindness, or is it payback? This month I’m on a cultural appropriation kick: as in, I’d desperately like to appropriate the food culture of Brooklyn hipsters and foist it on my indifferent - but amused - parents. I really hope my new mission can combine my love of passive-aggressively bossing around my parents with their love of passive-aggressively mock-supporting me. “Mom, the point is that you.will.love.this. This is how people eat in the 21st century. It's actually fresh...Look, Mom, I made it. Just eat it,” I respond, setting down the minted beet and goat cheese salad. Monday means Vegan Day. This being California, my mom has been a vegetarian for 40 years, but that doesn’t spare her from my sermonizing! Oh no! If anything, that earns her more because she’s been doing the right thing “the wrong way” for decades! So much to unlearn! Cook entire pound of bacon. Remove bacon, retain all fat. Scramble eggs and fry in the fat. Remove eggs. Pour excess bacon fat over eggs and bacon. Dip white bread in bacon fat, and enjoy. After gorging on this while everyone else at the table is subsisting on hard-boiled eggs, grapefruit, and self-loathing, make sure and point out that "the tequila burns it out - cleans the fat out of the arteries, and keeps you thin." So for today I’m going to force my family to eat something I’ll creatively call “Quinoa Bowl” - my Berkeley sister (who is definitely in on my Torture The Parents Plan) “accidentally” left a big bag of quinoa at the house in a move I will interpret as “Tag You’re It.” I accept that challenge! For the quinoa, instead of soaking and rinsing, I hold it under the faucet in a mesh colander - a quick way to reduce the "soapy" taste from the residue. Then, throw in mom's rice cooker with a 2:1 water:grain ratio. Let the quinoa cool down - I don't like the combination of hot quinoa and cold cucumbers. Roast broccoli is a jillion times better than any other broccoli - cut florets lengthwise, then drizzle with olive oil and salt, roast at 400 for 30 minutes or so. So shockingly delicious. Go outside and look for avocados - remember that avocados don't ripen on the tree and go looking for one on the ground that the birds haven't gotten to. Add Veggie Bites your mom bought for herself from Costco - these are like vegan tater tots, except they taste like Ikea's vegetarian meatballs. They're awesome. 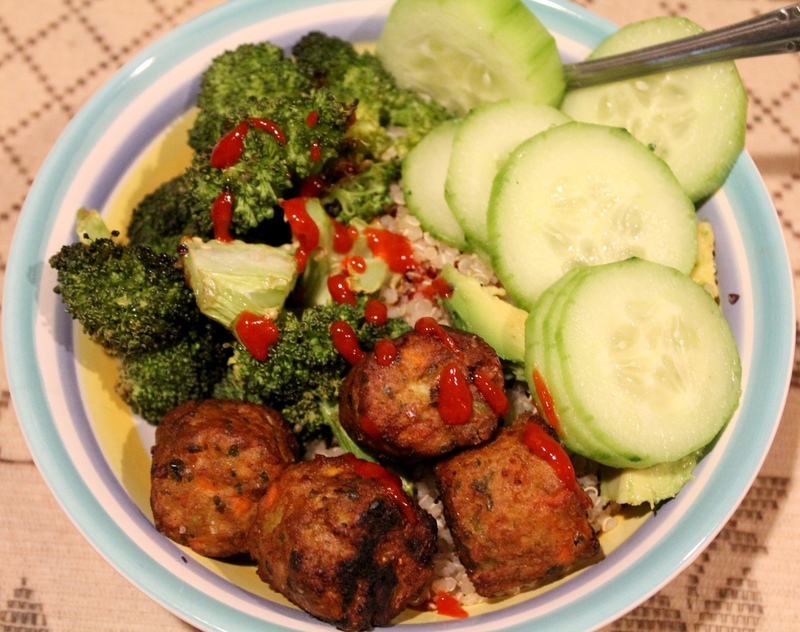 How could you possibly have a Quinoa Bowl without Sriracha? I don't know. I know that quinoa dishes emphasize "healthy" instead of "yummy" - and I don't know exactly why, but this bowl combination is actually delicious. My Dad and teenage boys all sat around the table in blessed rare silence while they happily gobbled this down. The kids took seconds so there wasn't even enough for my Mom, which was kind of a bummer since I really wanted to show off <<ahem>> "*modern* vegetarian" food. But the real seal of approval was my Dad. "Yeah, I know, but what did you think about the quinoa?" "What's the quinoa? Oh, that's like the rice, right? I always forget. Yeah, it was good."